Laguna local Mary Williams’ Lacewings Foundation made a $10,000 gift to aid the R Star Foundation in rebuilding quake-damaged villages in Nepal. “We are delighted and grateful,” said Rosalind Russell, founder of R Star, which began working in poor rural Nepalese villages in 2003. Donors to the organization are credited with the distribution of 15,000 goats, building a school, drilling water wells, job training and adult literacy classes. R Star’s program manager Rabin Sitaula began delivering food and temporary shelters to the three of 48 villages where R Star has donated goats. While unable to reach every village, he’s directed aid there from other agencies, Russell said. 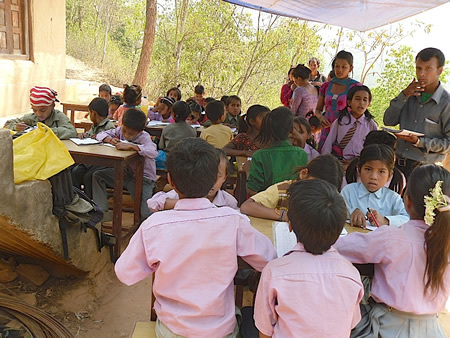 Top of the World – Nepal school reopened June 2 under tarps. While the school was the only building standing in Wojethar, repairs are necessary before resuming classes indoors, said Russell, who is redirecting R Star’s resources for housing and other needs. For more info: visit RStarFoundation.org or 949 497-4911.